Fun Facts: Founded in Turin in 1899, Fiat Group currently produces vehicles under twelve brands: Abarth, Alfa Romeo, Chrysler, Dodge, Ferrari, Fiat, Fiat Professional, Jeep, Lancia, Maserati, Ram Trucks, and SRT. The Fiat 500 won the 2008 European Car of the Year award, the first Fiat car to win the award was the Fiat 124 in the year 1967.
is the largest and most active FIAT brand enthusiast group in North America, with local chapters holding yearly events that draw attendees from all over the world. Founded in 1983, this is a real club with a solid history of success, with name recognition by FIAT. Fiat S.p.A. (Fiat Group) is an Italian automobile manufacturer, engine manufacturer, financial and industrial group based in Turin in Northern Italy. Founded in 1899 by a group of investors including Giovanni Agnelli, the company name FIAT is an acronym for Fabbrica Italiana Automobili Torino (Italian Automobile Factory of Turin), though it also means "let there be" in Latin. Fiat has also manufactured tanks and aircraft. Fiat based cars are constructed all around the world - the largest concern outside Italy is in Brazil. It also has factories in Argentina and Poland (the former state FSO facility). Fiat has a long history of licensing their products to other countries regardless of local political or cultural persuasion. Joint venture operations are found in France, Turkey, Egypt (with the state owned Nasr car company), South Africa, India and China. Fiat Group is the largest automobile manufacturer in Italy, with a range of cars starting from small Fiats to sports cars made by Ferrari. Car companies includes Fiat Group Automobiles S.p.A, Ferrari S.p.A., Iveco S.p.A. and Maserati S.p.A.. The Fiat Group Automobiles S.p.A consist companies: Abarth & C. S.p.A., Alfa Romeo Automobiles S.p.A, Fiat Automobiles S.p.A, Fiat Professional and Lancia Automobiles S.p.A. . Ferrari S.p.A. is owned by the Fiat Group, but is run autonomously. Giovanni Agnelli founded Fiat in 1899 with several investors and led the company until his death in 1945, while Vittorio Valletta administered the day-to-day activities of the company. Its first car the 3 ½ CV (of which only eight copies were built, all bodied by Alessio of Turin) strongly resembled contemporary Benz, and had a 697 cc (42.5 cu in) boxer twin engine. In 1903, Fiat produced its first truck. In 1908, the first Fiat was exported to the US. That same year, the first Fiat aircraft engine was produced. Also around the same time, Fiat taxis became somewhat popular in Europe. By 1910, Fiat was the largest automotive company in Italy — a position it has retained since. That same year, a plant licensed to produce Fiats in Poughkeepsie, NY, made its first car. This was before the introduction of Ford's assembly line in 1913. Owning a Fiat at that time was a sign of distinction. A Fiat sold in the U.S. cost between $3,600 and $8,600, compared to US$825 the Model T in 1908. Upon the entry of the U.S. into World War I in 1917, the factory was shut down as U.S. regulations became too burdensome. At the same time, Fiat had to devote all of its factories to supplying the Allies with aircraft, engines, machine guns, trucks, and ambulances. After the war, Fiat introduced its first tractor, the 702. By the early 1920s, Fiat had a market share in Italy of 80%. In 1921, workers seized Fiat's plants and hoisted the red flag of communism over them. Agnelli responded by quitting the company. However, the Italian Socialist Party and its ally organization, the General Confederation of Labor, in an effort to effect a compromise with the centrist parties ordered the occupation ended. In 1922, Fiat began to build the famousLingotto car factory — the largest in Europe up to that time — which opened in 1923. It was the first Fiat factory to use assembly lines; by 1925, Fiat controlled 87% of the Italian car market. In 1928, with the 509, Fiat included insurance in the purchase price. Fiat made military machinery and vehicles during World War II for the Army and Regia Aeronautica and later for the Germans. Fiat made obsolete fighter aircraft like the biplane CR.42, which was one of the most common Italian aircraft, along with Savoia-Marchettis, as well as light tanks (obsolete compared to their German and Soviet counterparts) and armored vehicles. The best Fiat aircraft was the G.55 fighter, which arrived too late and in too limited numbers. In 1945 — the year Mussolini was overthrown — the Italian Committee of National Liberation removed the Agnelli family from leadership roles in Fiat because of its ties to Mussolini's government. These were not returned until 1963, when Giovanni's grandson, Gianni , took over as general manager until 1966, as chairman until 1996. Among the younger Agnelli's first steps after gaining control of Fiat was a massive reorganization of the company management, which had previously been highly centralized, with almost no provision for the delegation of authority and decision-making power. Such a system had worked effectively enough in the past but lacked the responsiveness and flexibility made necessary by Fiat's steady expansion and the growth of its international operations in the 1960s. The company was reorganized on a product-line basis, with two main product groups — one for passenger cars, the other for trucks and tractors — and a number of semi-independent division and subsidiaries. Top management, freed from responsibility for day-by-day operations of the company, was able to devote its efforts to more far-reaching goals. In 1967, Fiat made its first acquisition when it purchased Autobianchi; with sales amounting to $1.7 billion, it outstripped Volkswagen, its main European competitor, and in 1968 produced some 1,750,000 vehicles while its sales volume climbed to $2.1 billion. According to Newsweek in 1968, Fiat was "the most dynamic automaker in Europe...[and] may come closest to challenging the worldwide supremacy of Detroit." Then, in 1969, it purchased controlling interests in Ferrari and Lancia. At the time, Fiat was a conglomerate, owning Alitalia, toll highways, a typewriter and office machine manufacturer, electronics and electrical equipment firms, a paint company, a civil engineering firm, and an international construction company. Following up on an agreement Valletta had made with Soviet officials in 1966, Agnelli constructed the AvtoVAZ plant in the new city of Togliattigrad on the Volga. This began operation in 1970, producing a local version of the Fiat 124 as the Lada. On his initiative, Fiat automobile and truck plants were also constructed in industrial centers of Yugoslavia, Poland, Bulgaria, and Romania. In 1979, the company became a holding company when it spun off its various businesses into autonomous companies, one of them being Fiat Auto. That same year, sales reached an all-time high in the United States, corresponding to the Iranian Oil Crisis. However, when gas prices fell again after 1981, Americans began purchasing sport utility vehicles, minivans, and pickup trucks in larger numbers (marking a departure from their past preference for large cars). Also, Japanese automakers had been taking an ever-larger share of the car market, increasing at more than half a percent a year. Consequently, in 1984, Fiat and Lancia withdrew from the United States market. In 1989, it did the same in the Australian market, although it remained in New Zealand. In 1986, Fiat acquired Alfa Romeo from the Italian government. Also, in 1986 15% of Fiat company stock was owned by Libya, an investment dating back to the mid-seventies. U.S. foreign policy under President Reagan's administration canceled a Pentagon contract to produce earth-movers with Fiat and pressured the company into brokering a buyout of the Libyan investment. In 1992, two top corporate officials in the Fiat Group were arrested for political corruption. A year later, Fiat acquired Maserati. In 1995 Alfa Romeo exited the U.S. market. Maserati re-entered the U.S. market under Fiat in 2002. Since then, Maserati sales there have been increasing briskly. Paolo Fresco became chairman of Fiat in 1998 with the hope that the veteran of General Electric would bring more emphasis on shareholder value to Fiat. By the time he took power, Fiat's market share in Italy had fallen to 41% from around 62% in 1984. However, a Jack Welch-like management style would be much harsher than that used by the Italians (e.g., precarious versus lifetime employment). Instead, Fresco focused on offering more incentives for good performance, including compensation using stock options for top and middle management. However, his efforts were frustrated by union objections. Unions insisted that pay raises be set by length of tenure, rather than performance. Another conflict was over his preference for informality (the founder, Giovanni Agnelli, used to be a cavalry officer). He often referred to other managers by their first name, although company tradition obliged one to refer to others using their titles (e.g., "Chairman Fresco"). The CEO of the company, Managing Director Paolo Cantarella, ran the day-to-day affairs of the company, while Fresco determined company strategy and especially acted as a negotiator for the company. In fact, many speculated the main reason he was chosen for the job was to sell Fiat Auto (although Fresco fervently denied it). In 1999, Fiat formed CNH Global by merging New Holland NV and Case Corporation. Over time, most automotive companies around the world have become holding companies of foreign as well as domestic competitors. For example, General Motors owned a controlling interest in Saab Automobile and, until recently, in Isuzu. Fresco signed a joint-venture agreement in 2000 under which GM acquired a stake in Fiat. This made it appear as if Fiat was next, although GM has made joint ventures with other companies (such as Toyota) without acquiring them. Nevertheless, Fiat did not see the GM partnership as a threat, rather as an opportunity to off-load its automotive business. The agreement with GM included a put option, which held that Fiat would have the right to sell GM its auto division after four years at fair market value. If GM balked, it would be forced to pay a penalty of $2 billion. When Fiat tried to sell GM the company, GM chose the penalty. On 13 May 2005 GM and Fiat officially dissolved their agreement. The current CEO however views alliances such as these as the deciding factor of the future success of Fiat. In 2005 Fiat was courting Ford. In more recent events Fiat are in the process of acquiring 20% of Chrysler (with possibilities of increasing this share) and has expressed an interest in acquiring GM Europe (Opel and Vauxhall). As part of the recent divestitures, in 2003 Fiat shed its insurance sector, which it was operating through Toro Assicurazioni to the DeAgostini Group. In the same year, Fiat sold its aviation business, FiatAvio to Avio Holding. In February 2004, the company sold its interest in Fiat Engineering, as well as its stake in Edison. Fiat faces a multitude of threats, including rising steel prices (up by 16-30% beginning of 2008), a strong Euro, and increased competition from Japanese and South Korean car manufacturers in Europe. Although the light-vehicle market share of Japanese and South Korean automakers in Europe is less than in the U.S. (12.5% and 3.9%, respectively versus 30% and 3.9% in the US), it has been increasing steadily at about a half a percent a year. On 20 January 2009, Fiat S.p.A. and Chrysler LLC announced that they were going to form a global alliance. Under the terms of the agreement, Fiat would take a 35% stake in Chrysler and gain access to its North American dealer network in exchange for providing Chrysler with the platform to build smaller, more fuel-efficient vehicles in the US and reciprocal access to Fiat's global distribution network. The new equity holder would have the option of increasing that to as much as 55%. Fiat, the stronger of the two, would not immediately put cash into Chrysler. Instead it would obtain its stake mainly in exchange for covering the cost of retooling a Chrysler plant to produce one or more Fiat models to be sold in the U.S. Fiat would also provide engine and transmission technology to help Chrysler introduce new, fuel-efficient small cars. The deal is the latest maneuver by Fiat's chief, Sergio Marchionne, who has pulled the Italian company back from the brink of collapse since taking over in 2004. The partnership would provide each company with economies of scale and geographical reach at a time when both are struggling to compete with larger and more global rivals like Toyota, Volkswagen and the alliance of Renault S.A. and Nissan. On April 30, 2009 Fiat announced the alliance with Chrysler, at first Fiat will get 20% stake and it can become the majority owner once the government loans are repaid. The FIAT initials were was first used in the distinctive logo form 1901. 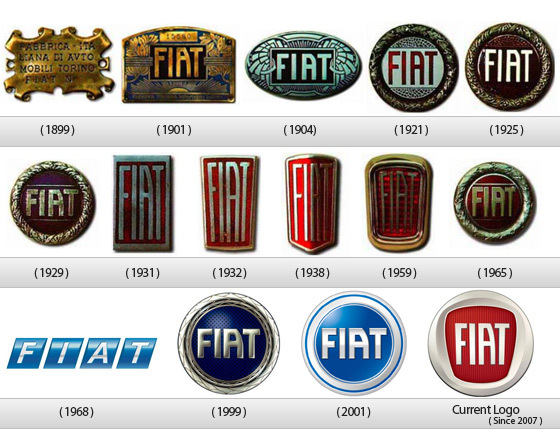 1901: FIAT decides to apply a proper logo on its cars: a small enamelled brass plate in the centre of which the name FIAT appears, with the characteristic A, which has remained practically unchanged up to the present day. 1932: The earlier rectangular shape took the form of a shield, a symbol fitting for the radiator grilles on the new models. With a series of slight variations, this logo was used on FIAT cars up until 1968. 1968: The logo featuring four blue rhombuses was adopted, a logo that was to become the main identifying element for the entire FIAT group. 1999: The brand's 100th anniversary saw a return to the style of the logo from the 1920s.The version chosen had a blue background, a chrome-plated logo, with the characteristic ‘A’, and a more stylised laurel wreath. 2006: The new FIAT logo is launched and set to be used on all future FIAT vehicles. In 1968 the "rhomboid" logo (as it was known internally) was introduced which featured the FIAT initials spelled out on four interconnected rhombuses. The rhomboid was slowly phased in during the early 1970s, although the older "laurel wreath" style FIAT badge was used to denote sporting models such as the 124 Spider, 127 Sport, X1/9 and the tuned Abarth models. A new corporate nose based on the rhomboid logo was first introduced in 1983 on the Uno, which consisted of five chrome bars inclined at an angle of 18 degrees to mirror the rhomboid, which usually appeared in reduced size at the corner of the grille.